The objective of evaporation is to concentrate a solution consisting of a nonvolatile solute and a volatile solvent. In the overwhelming majority of evaporations the solvent is water. When the liquid phase is agitated, mass-transfer in the liquid phase is sufficiently rapid that the rate of evaporation of solvent can be determined by the rate of heat transfer from the heating medium, usually condensing steam, to the solution. Evaporation differs from drying in that the residue is a liquid-sometimes a highly viscous one-rather than a solid. It differs from distillation in that the vapor usually is a single component, and even when the vapor is a mixture, no attempt is made in the evaporation step to separate the vapor into fractions. 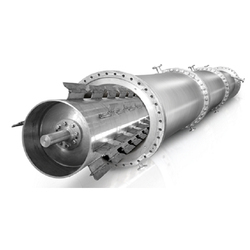 Agitated Thin Film Evaporators consists of a vertical steam-jacketed cylinder and the feed solution flows down as a film along the inner surface of large diameter jacket. Liquid is distributed on the tube wall by a rotating assembly of blades mounted on shaft placed coaxially with the inner tube. The blades maintain a close clearance of around 1.5 mm or less from the inner tube wall. The main advantage is that rotating blades permits handling of extremely viscous solutions. 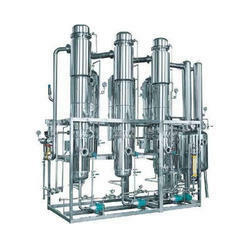 The device is suitable to concentrate solutions having viscosity as high as up to 100 P.
Falling Film Evaporator (FFE) is a vertical shell and tube heat exchanger with a vapor- liquid separator mounted at the bottom. The liquid to be concentrated is fed at the top of the heated tubes and distributed in such a way that it flows down on the inside surface of the tubes as a thin film, under the influence of gravity. As the film gets heated, the vapors generated flow co-currently. The drag of vapors increases the turbulence and improves heat transfer performance. The balance liquid and vapor are separated in the vapor- liquid separator. 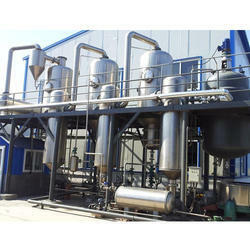 Looking for Industrial Evaporator ?